LOS ANGELES – Nov. 1, 2012 – Today Atari, one of the world’s most recognized publishers and producers of interactive entertainment, has released Atari Outlaw™ for iPhone, iPad and iPod touch. Atari Outlaw, a classic franchise from the Atari library, now rides again as a casual shooter, combining the Western themes of the original hit with colorful hand-drawn graphics, an expanded arsenal of weapons and smooth touchscreen controls. Atari Outlaw is available as a free download on the App Store at http://itunes.apple.com/app/id553864821. 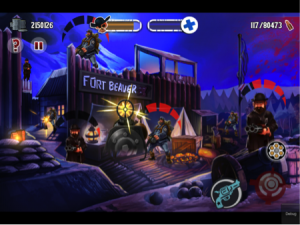 Developed by Flying Wisdom Studios, the Wild West shooter puts players in the boots of a well-armed bounty hunter, out to become the quickest draw in the West. By gunning down banditos, miners, and other yellow-bellied varmints, players will collect in-game silver and gold, which can be used to buy new weapons, upgrade their firearms, and restock on ammunition. Players can gun for the top spot on the leaderboards and prove to their friends just who among them is the toughest gunslinger in the saloon. Disarm your opponents, kill waves of enemies and blow up whatever gets in your way. Multiple Wild West locations from the High Sierra to Fort Beaver. Collect a variety of cool weapons from Buzz Sawyers to Tesla guns that shoot lightning bolts. Upgrade your weapons to increase power, accuracy, fire rate and more. Game Center integration to show off your skills with achievements and leaderboards. For more information about Atari Outlaw, visit www.atari.com or visit Facebook at www.facebook.com/atari.